Description: The greatest thing that we can learn from Gid'on is that his faith was able to turn weakness into strength. When we first encounter Gid'on, he does not come across as a man of faith. He sounds like he doubts G-d’s ability to deliver Israel from the Midianites, does not consider himself a mighty man of valor, and seeks confirmation over and over again from Adonai about the mission being assigned to him. Yet, he is listed in this Hall of Faith in Hebrews 11. I believe his story will help each of us activate our faith so that we can turn our weaknesses into strengths as well. In doing so, we, like Gid'on, will be able to route the enemy from our lives, our family, and our community. 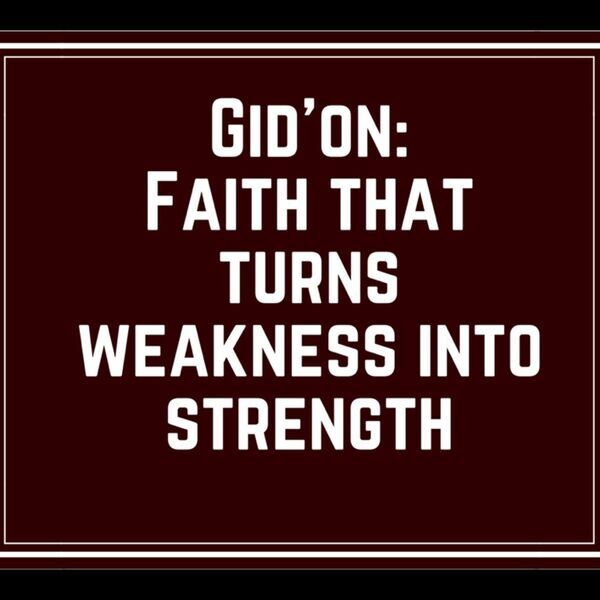 The greatest thing that we can learn from Gid'on is that his faith was able to turn weakness into strength. When we first encounter Gid'on, he does not come across as a man of faith. He sounds like he doubts G-d’s ability to deliver Israel from the Midianites, does not consider himself a mighty man of valor, and seeks confirmation over and over again from Adonai about the mission being assigned to him. Yet, he is listed in this Hall of Faith in Hebrews 11. I believe his story will help each of us activate our faith so that we can turn our weaknesses into strengths as well. In doing so, we, like Gid'on, will be able to route the enemy from our lives, our family, and our community.